Here are a few tips to get you started, but also maybe some of the experienced players will find some useful strategies. - how to upgrade army. Either if you are in the castle or in the hero’s army menu, you double tap on the unit and you’ll have an option to upgrade them if you tap on the 3 green double-arrows symbol. Also the units that have an upgrade possible will have 2 green arrows in their icon. - how to forge an item – enter the hero menu and in the bottom-right you have 3 icons. Select the first one with the hammer. Drag the artifact you want to enhance. Normal white items can’t be forged. If you have all the required materials then tap on the icon that has a hammer with a few sparks. - how to melt your items – in order to obtain the materials for forging items you have to first melt what you don’t need. Select the icon under the hammer. Drag the artifact on the empty slot and push ‘Confirm’ Button. Be careful that melting an item is not undoable, not even if you reload the game. The items will be lost forever and you’ll remain with the materials. A very good unit and cheap is the Sharpshooter and you usually get some Archers starting bonuses. The idea is to have a very strong hero that can win alone many battles and additionally to have one power stack rangers to clear a range threat. If you choose to play with Liu Bei after Level 3 you’ll be able to upgrade the Farmers to Guardsmen and get an infantry power stack. The idea with the power stack is to kill the enemy stack from one blow so that it won’t retaliate and produce damage. Turns in combat come from upper to your lower units when they have the same attack speed. If you want one unit of yours to attack first keep in mind to put it first in the line. This is very useful especially if you want your Archers to shoot enemies’ Archers first. Another strategy is to see what units to kill first. Most of the times this is the case of ranged units or spell-casters. Sometimes you fist kill the siege weapons (when you defend your castle). When defending your castle stay as much as you can behind the walls. From time to time you can get out with your hero do damage and then enter again the walls to regenerate. Don’t be afraid to hit and run, even if the battle will take many turns. There is no bonus for finishing the battle faster. Sometimes it’s better to let as last unit enemy’s Ballista between 2 of your units (like in the screenshot bellow) and you will have time to heal all your army back. Another strategy when defending your castle and one wall is already broken (so that enemy can come in the garrison) is to get a fast flying units (like the Fiery Sparrow) and while the arrow towers fire you just fly from corner to corner baiting the infantry. Sometimes during combat it’s better to split your army and have a few stack of 1 unit (usually weak units like farmers). They will be able to bait enemies, waste a retaliation or stay around your archers so that they won’t be blocked. 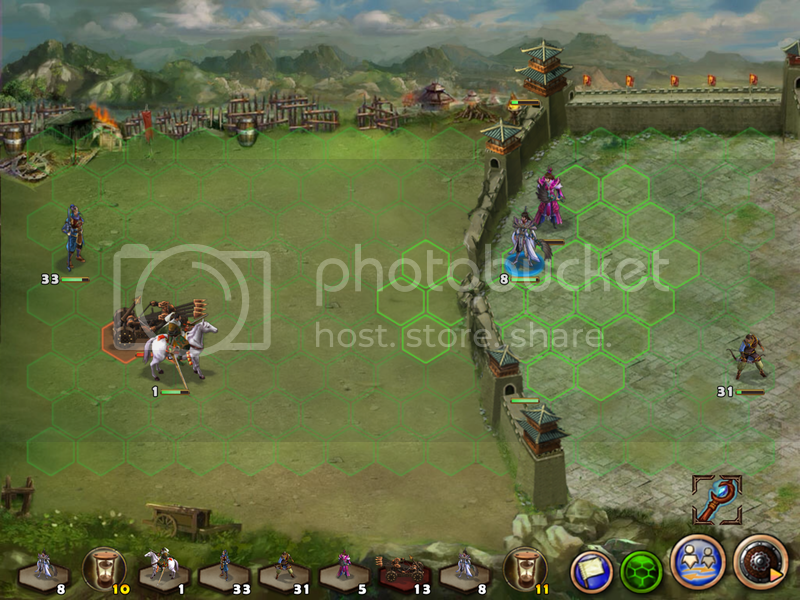 Campaign 3 – Ingenious Troops is a very good Campaign for leveling your new level 1 heroes. You can start it on last difficulty level and have a good chance to win it easily because you have the advantage of the castle. The only thing you have to do is build your Arrow Towers and defenses, upgrade your Archers to Sharpshooters and clear all the ranged enemy units before they break the walls. After that is easy – just end turn and finish all with your ranged units. You’ll easily get to level 6 in a few minutes. Here is a little exploit to help you level up fast. Cheng Yuanzhi will attack you in day 1. Finish the battle and remain with the experience. End turn till you’ll be in day 4. After that immediately load the game ‘3 days back’. You will be again in day1 but the experience you took in the previous battle will remain. Cheng Yuanzhi will attack again. You get around 700 exp on max level difficulty per battle. And so on. You can use this exploit to level up faster without having to exit the campaign or finish it. You just have this battle. Also this exploit can be used in other Campaigns and it’s especially useful if that battle you want to repeat is later in the Campaign so you don’t have to restart over and over again. I use it to keep the experience and also redo the battle till I’ll get it perfect. It only works when you load 3 days back. If you load 1 day back you lose the experience. When you attained level 5 with the hero, go to the shop and buy the Venom-resist Armor for 350 exchange points. This armor will offer you the possibility o regeneration. Another thing is that you can have only one set of artifacts that can be used for more Heroes. If you put your artifacts to your right inventory that is common for all your heroes. So if for example you play with 2 heroes in the Yellow-turban rebellion you’ll be able to transfer you equipment from one hero to the other when you have an important battle with the respective hero. It’s a pity that the movement points bonus that you have from the Horse won’t change immediately after equipping it. The game will list that you have more AP, but actually you’ll move the same. If you want to get the bonus to your other hero, you have to equip it with the Horse artifact and after that Load the game ‘1 Day Back’, but you’ll lose the bonus from your initial hero. I don’t know if this is a bug or was intended like this, but for now it is what it is. Playing Liu Bei will help you not to lose army and obtain 3 stars because you can use the Heal spell. To use it efficiently you can leave for the last unit stack in battle a ranger unit of 1-2 units and while they won’t do much damage you’ll have all the time in the world to heal your army. Another option is to block the ranged unit and they will move most of the time losing their turn as I previously wrote in combat strategies. This is all for now. I’ll add more things in the future. Good luck & enjoy playing!